Male gadwall are drabber in appearance than other ducks and are often called "gray mallards" or "gray ducks." These are the only puddle ducks with a white speculum. Gadwalls have an average length of 21 inches and an average weight of 2 pounds. 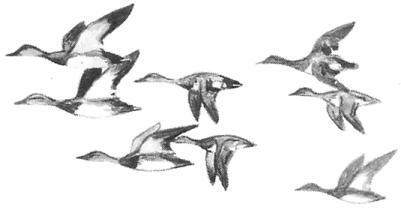 Gadwalls are most numerous in the Central flyway, but not too common anywhere. Gadwalls are found in all but the westernmost part of South Carolina during the winter months. Their summer habitat includes well-vegetated wetlands with emergent plants, like prairie potholes of the Great Plains. 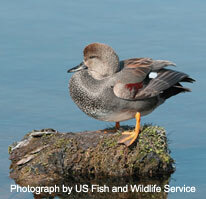 Gadwalls overwintering habitat includes ponds, reservoirs, and coastal, fresh and brackish marshes. Gadwalls feed primarily on seeds, submerged aquatic vegetation, and aquatic invertebrates. Gadwalls form pair bonds during fall migration and on the wintering grounds. On return to their summering habitat, the female selects a nest site in dense vegetation. The female scrapes out a nest and surrounds it with leaves and twigs. When the nest is complete she lays 7-12 dull white to greenish gray eggs. 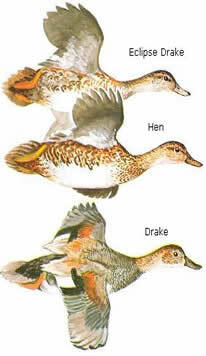 Drakes whistle and kack-kack, and hens quack like a mallard, but softer. One of the earliest migrants, seldom facing cold weather. Small, compact flocks fly swiftly, usually in a direct line with rapid wingbeats. Excellent swimmers, but rarely dive for food. Will steal food from American coots and other ducks. During the breeding season males exhibit a level of tolerance toward other males, only becoming aggressive in mate defense.